Inle Lake is a shallow lake in the middle of Myanmar, south-east of Mandalay. The lake is 22 km long and is densely inhabited by many different tribes. The lake, ringed with mountain ranges is a haven for waterfowl and other birds, some of which are endangered species. 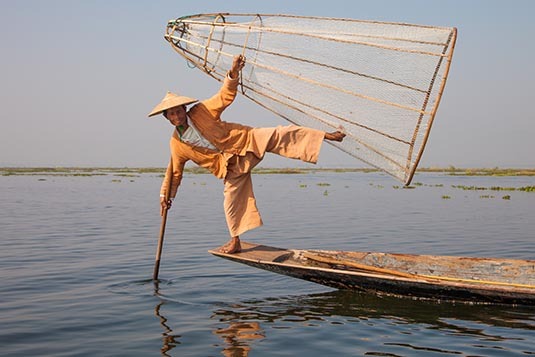 This natural and unpolluted Inle Lake is famous for its scenic beauty and the unique leg rowing of the Inthas who have developed an original, eccentric method of rowing their small boats with one leg standing at the stern of boat. The Intha tribal race, many of whom live in stilted houses built over the water, which is only 20 feet at the deepest. The lake is full of floating vegetation and houses. There are about 18 villages around the lake. They are Buddhist and hundreds of Buddhist monasteries and pagodas can be found around. A 40-minute flight from Nyuang U (airport for Bagan), got us at Heho airport mid-morning. Morning is a very busy time at this small airport. There’s no belt. Luggage is manually placed in one corner by porters. Once you have identified your bags, you are ready to go. Our guide was waiting for us. We used the porter service to carry our bags to the waiting bus. The rates are fixed – about 300 Kyats per bag. At the time of writing 1 USD fetched 1350 Kyats. Pretty cheap, eh? Final destination on road was the jetty at Nayaungshwe. From there we would take a boat on the Inle Lake to reach our hotel. Enroute to jetty we made a brief stop at Shan paper and umbrella making unit. After enriching ourselves in the art, we drove for another 30 minutes to arrive at the jetty. Inle boats are quite unique. Long and narrow, they have 5 chairs each. At first glance one wonders about the boat’s stability and comfort. But once you sit in, it’s really safe and very comfortable. The boats would be our mode of transportation for the next 2 days. Since you would be out in the open, it’s advisable to carry sunscreen and umbrella. The boats provide with life-jackets and blankets that can surely come in handy. We were booked at Aureum Resort and Spa – a 30-minute boat ride. The resort is located at Mine Thauk Village and houses 66 units of exclusive super-deluxe accommodation straddling the edge of Inle Lake. The sprawling resort is perched on the edge of the lake waters with, the main facilities and front-row villas spilling over onto the lake and on-shore villas hugging the banks of the lake. 100 square meter bedrooms are elegantly decorated with generous space for bathroom and Jacuzzi and lavishly equipped with five-star amenities. With private outdoor terrace for viewing a spectacular sunset over the lake, Aureum Resort & Spa is poised to offer unsurpassed hotel experience at this unique destination. A wonderful welcome awaited us. After checking in and freshening up, we were ready to take our boats for a 30-minute ride to enjoy our lunch at Tun Tun Restaurant on the lake overlooking the famous Phaung Daw Oo Temple. In every October, both local and foreign pilgrims and visitors flock to this temple for its annual pagoda festival which is held in full of pageantry and splendour. Phaung Daw Oo images are widely believed to have mystic miraculous power. Thus, the Buddha statues have been gilded throughout the length of time by many devotees from all over the country so much so that the statues have lost the original shape and seem solid masses of pure gold. On the festival days, the Buddha images are carried on a decorated royal barge (called Karaweik) and conveyed around 14 villages on the lake. The barge is drawn by boats of leg-rowers and hundreds of boats follow the procession. The large crowds of people gather on the lake-shores to celebrate the occasion. The most interesting event of the festival, especially for foreigners is their boat race due to their unique leg rowing. 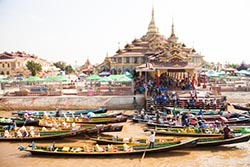 Boat races are held during the festival and on the last day, a race happens with three long boats, containing one hundred people each, standing upright and rowing with their legs in the traditional Inle style. It is the one and only place in the world where one can see such marvelous act. Of course, we could not see the action as it was February. The boats are quite fast, but stable. They just zip past making the ride a fun one. 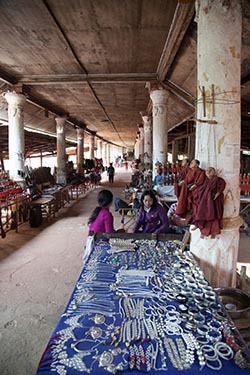 Our next stop was Inn Paw Kone village, famous for its lotus silk and cotton weaving. The lotus stems are chopped in two parts and from within, the threads are pulled out. These threads eventually gets converted into wonderful and colourful fabric. The next on the agenda was visiting Nan Pan village. Here we visited a cigar (cheroot locally) making unit. Cheroots from Inle are popularly known as ‘sweet cigars’- simply because rolled into the tobacco leaf are dried bananas, honey, mint and other flavours. I am not a smoker but I am told they are not mild and have the potency of giving a ‘kick’. Tourists are usually offered the first stick free with the hope that they will get hooked. Most do! The village is also famous for boat building. Manual labour goes into making the boats. Had they used mechanical tools to cut and shape the wood, I am sure the boats would be built cheaper and faster. But I guess, the boat building industry gives employment to hundreds. That was for the day. We returned to our hotel to enjoy the rest of the evening. On our way back, we could see the antics of a few fishermen. Truly amazing feat. After an early breakfast the next morning we took our boats to visit the famous ‘5-day Market. It’s a rotating market that moves around the villages and towns of Shan state near Inle Lake, where tribal people in their costume come from nearby villages to sell their fruit, vegetables, fish and meat. At the time of our visit the market was at Nan Pan Village. It was a rush hour. We actually had to wait a while for our boats to find a parking slot! The floating water hyacinth is the major products of this region. The main vegetables are tomatoes, beans, cauliflower, cabbage, eggplant, garlic, onion, betel, melon, papaya and banana. Some villagers also grow rice. The Inthars also make their living by fishing. We were allocated 1 hour to explore the market. The pictures will tell you more about the sellers and their wares. From the 5-day Market we moved to Ywa Ma village known for its silver making facilities. We spent an hour understanding the process and then proceeded to Inn Dein Village to enjoy our lunch at the famous Golden Kite Restaurant. The owner was around and is known to make some good pastas and pizzas. It was an expensive place in comparison to what other restaurants in Myanmar charge. But the food was good! 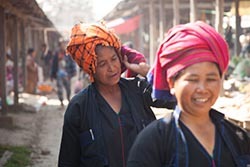 Inn Dein is one of the villages that host the Inle '5-day Market'. Inn Dein is best known for its many ancient pagodas in many shapes and sizes and in various states of preservation. While some have been restored, others are in their original crumbling state. There are two groups of ancient pagodas, Nyaung Ohak and Shwe Inn Thein. The first site near the boat landing is Nyaung Ohak, which translates to “group of banyan trees”. Most of the pagodas here have not been restored and are in various states of repair; some are well preserved, while others have plants and trees growing out of them. Many pagodas are decorated with sculpting of celestial beings or mythological animals as Naga serpents and Chinthes. Some enshrine images of the Buddha. From Nyaung Ohak a climb leads to the second group of pagodas named Shwe Inn Thein located on top of a hill. A 700-metre covered walkway leads up to the pagodas. The walkway is lined with stalls where vendors sell Shan shoulder bags, longyis, shirts and other items. The site is believed to date back to the days of the Indian emperor Ashoka, who sent out monks in the 3rd century BC across Asia to spread Buddhism. Centuries later two Kings of the Bagan Empire, Narapatisithu and Anawrahta built pagodas at the site. 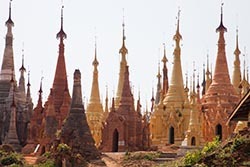 The site contains hundreds of pagodas, collectively known as the Shwe Inn Thein pagodas. Most are from the 17th and 18th century; the earliest one with an inscription dates to the 14th century. At the center of the Shwe Inn Thein group is the shrine of the Inn Thein Buddha image. The shrine that is believed to have been built by King Ashoka houses a golden Buddha image in the meditation mudra. 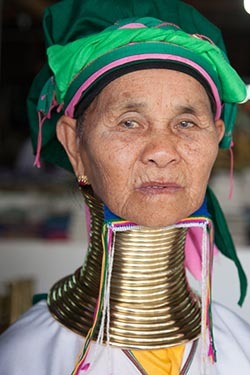 On our way back to our resort, we made a brief stop to meet the ‘long neck’ women of Padaung. This long neck tribe has about 7000 people nowadays. When the girls are at 5, they start to wear the necklaces. The more laces are worn, the longer their necks are. A female adult may have up to 35 necklaces; they can’t take them off or their neck will be easily broken. The Padaung consider the longer neck they have, the more elegant they are. Unlike any women in the world, the Padaung long neck women are happy with their special ‘fashion’. They not only wear necklaces but also bracelets but the most attractive point is always the long neck like giraffes. And that brought to an end our 2 wonderful days in Inle Lake. Tomorrow, we fly to Yangon – our final destination of the Myanmar trip.